Two years ago, we celebrated the fourth of July like many other families in America: with hamburgers and grandma's potato salad recipe and round after round of seconds. 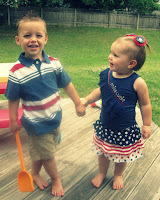 Two years ago, we celebrated in red, white and blue outfits, watching the kids play in the sprinkler and relaxing on the front porch swing, casually conversing about where to go to watch fireworks this year. Two years ago, we celebrated with mama's famous layered jello piled high on our plates, sinking into leather couches without a care in the world. Two years ago, all the kids greeted her big smile and golden hair with even bigger smiles and brighter eyes, because they couldn't wait to get to play with Ms. Loryn. Two years ago we sat down and chatted about all the characters in the office where we worked together, and what it was like being a student at The Ohio State University. 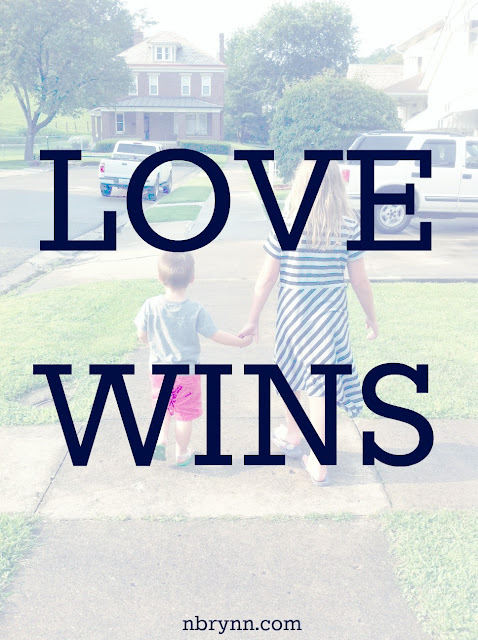 Two years ago, she leaned in and asked me how a recent visit to be re-united with our foster son had gone, an ever-present sign of her tender, thoughtful heart. Two years ago, she waived goodbye and we loaded the kids into the car, waiving in return, never fathoming it would be our last exchange. Two years ago, she hopped into a car...two years ago, the world lost her in a tragic, senseless accident. As I have been thinking about Loryn's life and that tragic event two years ago, I keep watching the series of events that began to unfold in my own life in the weeks and months afterward. So many unexpected twists and turns, questions and confusion, healing and growth. In every way, I owe it to Loryn that this blog exists at all, that I found a way back to writing, and back to myself. One of the questions that I couldn't shake after the funeral, was about the existence and nature of life after death. 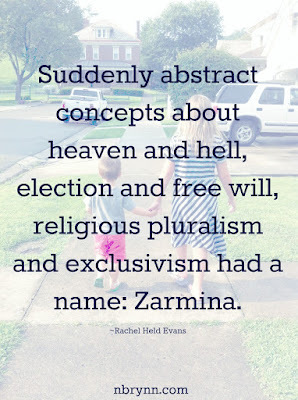 I grew up with a very conservative, fundamentalist perspective on heaven and hell - heaven as a place of pure beauty and bliss reserved exclusively for those that had accepted Jesus into their hearts and lived their lives for Him, and hell as a place of fire and torment, reserved for everyone else. I had struggled with this strict line in years past, but never with the intensity that I now wrestled, fighting through all the confusing and painful implications. So, if only those that accepted Jesus into their hearts went to heaven, what about all those kind, good people that died before their time? What about all those people born into other cultures and in other times? How could a loving God send a majority of the world population to a place of eternal torment? And why would I want to follow him if he did? Before you fill the comment section with answers to all these questions, I should say, I know the "right" answers. I know from sitting in the front row during sermons for a decade, diligently taking notes, that none of us deserve heaven anyways. I know from my year of Christian leadership school and dozens of apologetics books the falsehoods that other religions teach and why the Great Commission is so urgent. I know from Bible studies and conferences and a half-dozen mission trips how to pray the right words with someone so that they can invite Jesus into their hearts, and how welcoming and loving he is when they choose to do so. But there came a point, two years ago, when all the "right" answers just didn't cut it. Rachel Held Evans discusses this in her book, Searching for Sunday, and describes her own wrestling after witnessing a muslim woman being tortured by other radical muslims. 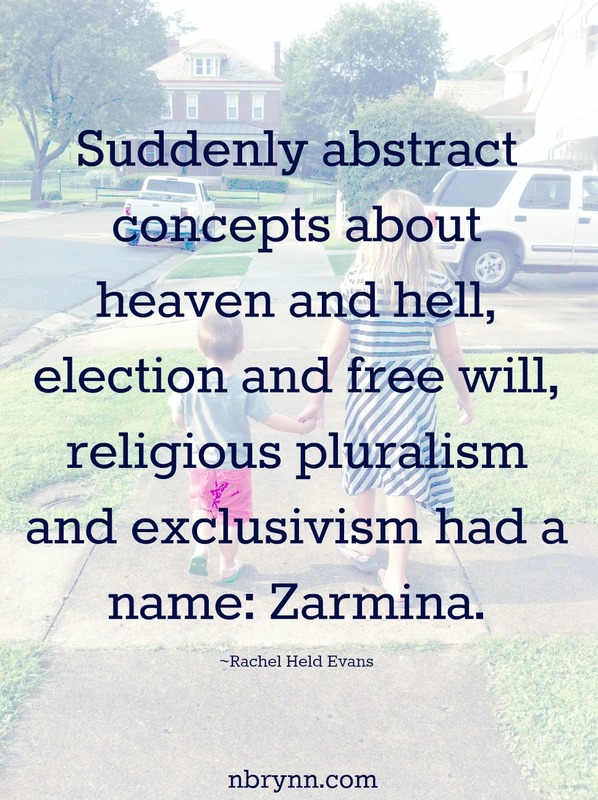 Evans writes, "Suddenly abstract concepts about heaven and hell, election and free will, religious pluralism and exclusivism had a name: Zarmina." For me, the name was Loryn. And like Evans, that name brought all my fundamentals, all my religious certainties and clear black-and-white answers, into a whole new light. That name taught me to stop and look further. That name helped me to embrace uncertainty and to grip ahold of love instead. I appreciated what Evans writes a few pages later, because it so succinctly describes my own train of thought during those struggles two years ago, "In Sunday school, they always make hell out to be a place for people like Hitler, not a place for his victims. 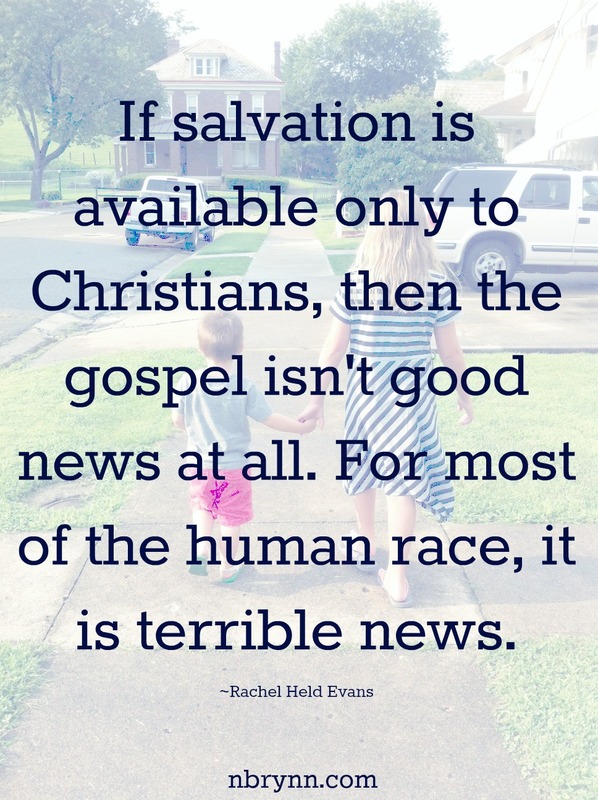 But if my Sunday school teachers and college professors were right, then hell will be populated not only by people like Hitler and Stalin, Hussein and Milosevic, but by the people that they persecuted...If salvation is available only to Christians, then the gospel isn't good news at all. For most of the human race, it is terrible news." Two years later, I don't have concrete answers for all my questions. I suppose in many ways, like grief, these questions will remain ever-present reminders of the loss of a loved one. They will ebb and flow in and out of my consciousness, forcing me to remain open, forcing me to remember, forcing me to feel all the joy of love and all the pain of loss again and again and again. And although I have not come upon absolute certainties, and although the afterlife will forever remain a mystery this side of things, I have settled into a simpler knowing, a softer hold on what may be. Today, two years later, instead of knowing who is in or out, instead of carrying a map of how it all works out, I am learning to look into eyes around me and to embrace humanity. I am learning to accept the mystery and to believe that love wins. I knew it when I toured ancient temple ruins with the only Thai friends we had made during our 18 months of living in Chiang Mai - these Buddhist friends that welcomed us into their home, celebrated birthdays, fought for our son, taught us their culture. I knew it when I kissed Ahlam, first on the left cheek, then on the right - this Iraqi Muslim mother of eight, who recently immigrated with her family to the U.S. under refugee status, and now sat decorating cupcakes with Whoppers to serve us for our first meal together. I knew it when Divya curled up in my lap and Jayanthi leaned on my should under the chirping monkeys of the banyan tree that shaded us from the hot Indian sun - these Hindu children of migrant workers who showed me worlds of kindness in their smiles and depths of love in their eyes that I had never before experienced. I knew it when I touched Loryn's cold hand, looked into her face and trembled at the stillness, knowing somehow, someway, this would not be the final goodbye.